Adam Terasinski | Copy Editor for "The Mount"
At 5:45 a.m. while everyone is still asleep, he makes his way to the basketball court to practice the sport that he loves. Sophomore Scott Ching brings not only a sense of excellent work ethic, but also has a background story worth telling. Ching was born in Singapore, a sovereign city-state, located in Southeast Asia. At the age of three he moved to Sydney, Australia. Ching attended secondary school at Oakhill College in Sydney which has approximately 1,600 students. It is the counterpart to what Americans would view as a high school. He decided to transfer to Mount Michael to hone his skills in basketball and to focus on academics as well. He plans on going out to play for the Knights this winter, “In Australia I played the position of guard due to my height. 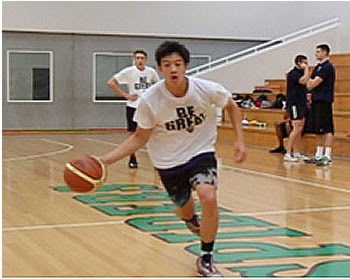 However, here I will probably play the position of either a point guard or shooting guard,” said Ching. He is an avid fan of the National Basketball League, the Australian counterpart to the American National Basketball Association. His favorite team is the Sydney Kings. Moving to a new school is often a frightening prospect itself, but moving to a new school in a new country can be a huge change. “One of the first things I noticed when I arrived in Nebraska, other than the corn of course, was really, the lack of transport,” he said. Of his new classes, chemistry was the most interesting to him. “Scott’s positive energy is contagious,” chemistry teacher Leah Zohner said.